Dunder Casino came on to our radar back in 2017 with the promise of providing a unique and immersive experience for players, how many times have we heard that one! Granted the opening theme on the homepage is very pleasurable, with it’s sub-tropical paradise mixed with iconic buildings. Dunder blends the surreal with the sublime beautifully. But as mush as casino’s try to make it appealing, this is not what hard-core punters are interested in. So does Dunder Casino deliver on it’s promise? We decided to stick on our overalls and give this brand-spanking new casino a full MOT. I’m always wary of casino sites that only provide new customer offers, it’s strong indicator that they don’t care about regular players and unfortunately this appears to be the case. With that said Dunder Casino’s new sign-up bonus is pretty impressive, with 20 spins when you register an account and up to £600 and 200 spins available across your first 3x deposits, at least it’s enough to keep you going in the short term. Lets break it down so you know exactly what to expect for each deposit. Players should aware that the bonus spins are not released immediately upon registration, but are issued 20 spins every day for the first 9 days of signing up. Spins are automatically added each day by opening Starburst. Failure to activate the spins within 24 hours will be removed, so make sure you active them each day. Bonus spins can only be activated through the homepage. Winnings from bonus spins and received bonus/ deposit amount have a 25 times wager requirement, which is quite reasonable and below the average of 35 for most online casinos. Surprisingly though all bonus money expires from 30 days after its been awarded. A minimum deposit of £20 is required to claim any bonuses and a maximum of £5 can be place with any bonus money. Great news slots and games have a 100% weight towards wagering, with all table games contributing to just 10%. Video poker does not contribute towards wager at all. There are a small selection of games that prove no weight to wagering what so ever, refer to Dunder Casino’s terms and conditions for more details. We were pleasantly surprised by Dunder’s speed and performance testing. The design team have ensured that Dunder is fully optimised to keep download times to an absolute minimum. 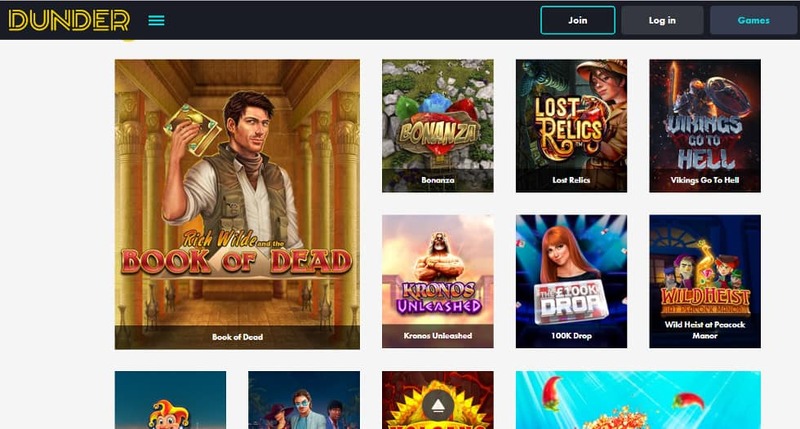 When you compare Dunder to some of the fastest loading casino sites, you’ll see that it fairs really well with times just slightly lagging some of the biggest brands in the industry. Loading times on games were equally impressive so you won’t be sat waiting too long for the progress bar to finish. What is apparent is Dunder’s focus on overall mobile UX. Clever little touches such as the icons and menu bar at the bottom of the homepage (which means you don’t have to stretch your thumb to the top of the phone) are perfect examples of this and make the overall user experience more pleasurable. Dunder Casino have made a decent effort to simplify finding specific games. The search icon at the bottom is a simple yet powerful feature and lets you quickly find the game your looking for. A quick tap of the controller icon and Dunder Casino quickly lists their top recommended games to play. They also have a handy categories section further down that allows you to browse a particular field if you’re still indecisive. The touchscreen responsiveness is just as good as most other casino’s I’ve come across and a quick swipe will allow you to effortlessly fly-down Dunder’s entire list of games. Not sure of what to play but don’t want to throw your hard earned cash away? Well with Dunder Casino you can try most of their games for free before committing to anything. Dunder has stuck with the more traditional banking payments which include VISA, Mastercard, Skrill, Neteller and Trustly. Expect the standard withdrawal times for bank transfers into your account of 2-4 working days. Some of the newer ewallets which include Neteller and Skrill are about twice as fast (normally 48 hours). Do be aware that punters looking to withdraw using Neteller are subject to a fee which is a percentage of the amount taken out. While it is a quick way of withdrawing money it does come at a price. While I had high expectations going into this, Dunder have really failed to deliver a knock-out feature that separates itself from the pack. Yes they’ve done great job creating a rock-solid platform that’s easy to navigate, but now days players expect so much more with the likes of Play OJO, Kaboo and High Roller providing avatars and reward-based systems to keep those dopamine addicts hooked. Don’t get me wrong this is a decent site and three years ago we would have given it full-marks. But online casinos have moved on and you need to keep pace with innovation. The lack of regular bonus offers is yet another red flag as far as i’m concerned, so while it’s worth taking advantage of their new players offers I wouldn’t stick around. Previous articleWhich Mobile Casinos accept Payforit deposits?